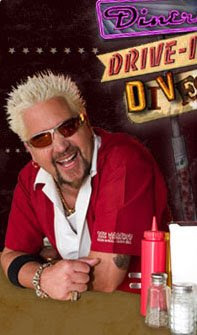 Diners, Drive-Ins, and Dives is one of my favorite Food Network Shows and that has a great deal to do with the show's host, Guy Fieri. I have been watching his career develop since he won Next Food Network Star and let me just say the guy has found his niche! Don't judge me, but I think I have a little crush on the guy. I love that he traipses all over the United States seeking out greasy spoon diners while celebrating the passionate folks running them. I love love love his sense of humor and speaking style...goodness his facial hair does not even bother me! I won't lie, we had heard that the show was taping at The Depot over the week-end and someone let it slip that they may be back today to finish up the filming, but we had no idea what time or what would be going on. We so picked the right time to swing by! As soon as the taping finished the film crew ushered folks to various tables in the restaurant and Tee and I unexpectedly found ourselves at the counter...we ordered soup and an omelet After Tee spoke to Guy and one of the producers we were told to "eat slowly" because we were going to be interviewed! They spent a good deal of time filming the room and food was parading out of the kitchen...two bowls of Chicken Noodle Soup, a Bacon and Onion Omelet, an open faced turkey sandwich, about 12 cups of coffee and two orders of donuts and mocha later we had experienced our 15 minutes of fame! I was filmed eating my soup for what seemed like an eternity and frankly eating soup under pressure is harder than you think. During the interview Tee spoke so eloquently I am pretty sure I will get edited out, but I don't care...it was just amazing. The little diner we were trying to save has suddenly hit the big time. The producers mentioned that we should all eat there as much as we can in the next couple of months because things will be different there once the episode airs! This is so, so, very cool. I cannot wait to watch this air. Keep up posted. Eating soup under the camera does sound quite intimidating (my nose always runs when I eat soup) so I am glad it was you and not me!! Ok I am a little late in the game. My kids and I saw a re-run episode and immediately after it ended jumped into the car and ate at the Depot. We arrived too late for Pot Roast Sandwiches and the donuts but everything else was delicious and the kids could get grape and orange pop there too. Great story...I am a food network junkie and we all love Guy too! Great story...we will be back to the Depot, I don't think my pot roast sandwich was an equivalent substitution!